Climate alarmists rarely believe their own rhetoric, or that the policies they advance would have any effect whatsoever beyond eliminating jobs across entire industries, increasing the power of government over our lives and making power more expensive and unreliable. The anthropogenic (human-caused) climate change alarm movement is fraudulent and farcical. 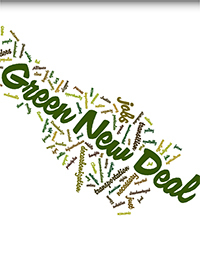 As if fresh confirmation of that reality was necessary, it arrived this week when Senate Majority Leader Mitch McConnell (R – Kentucky) allowed liberals to match deed to word by bringing their “Green New Deal” to vote. It failed 57-0, with its purported advocates voting “present” instead of for it. Predictably but laughably, Green New Deal proponents and their media apologists attempted to dismiss this as some sort of intricate legislative stunt by Leader McConnell, “a cynical ploy to ensure climate policy continues to go nowhere.” The reality, however, is perfectly straightforward and damning. After all, it wasn’t as if McConnell concocted the bill’s provisions or distorted their extremist wish list. He simply took their own bill and put it to a vote. In the House of Representatives, the bill was introduced as H.Res.109 on February 7 by freshman Representative Alexandria Ocasio-Cortez (D – New York) and nearly 100 co-sponsors. On the Senate side, the same bill was introduced by Senator Ed Markey (D – Massachusetts), along with ten co-sponsors, including 2020 presidential candidates Bernie Sanders, Elizabeth Warren, Kamala Harris, Corey Booker, Kirsten Gillibrand and Amy Klobuchar. Sounds pretty earnest, doesn’t it? Taking them at their own word, time is clearly of the essence, right? Leader McConnell accordingly allowed them to get to work immediately by holding a vote this week. Instead of voting for their own bill, however, Senators Markey, Booker, Warren, Sanders, Harris and the rest voted “Present” in protest, and the bill went down to a 57-0 defeat. Senator Markey complained that it was a “stunt” for McConnell to allow a vote “without hearings, without expert testimony.” But all that would have done would be to allow others to water down his bill, so it was an odd rationalization for his vote. Additionally, those who introduced the bill are the same people who falsely complain that McConnell somehow violated his constitutional duty by not allowing a confirmation vote on Merrick Garland, Barack Obama’s nominee to replace the late Justice Antonin Scalia on the U.S. Supreme Court. Yet now McConnell is some sort of villain for taking the opposite approach, and allowing an immediate vote on an issue they claim only possesses a ten-year window to avert disaster? Do they prefer to wait another several years to see if their party recaptures the White House and Senate in 2020, leaving only eight years to save the planet? What if President Trump wins another four-year term, or the Senate remains in Republican control? What then? We’ll only have six years to meet their own self-imposed 2030 deadline. The answer, of course, is obvious. Climate alarmists rarely believe their own rhetoric, or that the policies they advance would have any effect whatsoever beyond eliminating jobs across entire industries, increasing the power of government over our lives and making power more expensive and unreliable. If they truly believe that we only had ten years to save the planet, then they’d want a vote immediately. For the record, climate alarmists would also support nuclear power if they truly believe their own rhetoric. Nuclear power is carbon-free, and more reliable than “green” energy sources like wind and solar, at one-third to one-fifth of the effective cost. But they don’t believe their own words. They simply seek to signal their alleged virtue without taking concrete action that might cost them. In that way, they’re no different than friends on social media who profess alarm over climate change and mock “deniers” of the “scientific consensus,” only to hypocritically post photos from their latest exotic vacation to which they traveled via carbon-burning jet, cruise ship or long-distance automobile travel. Climate alarmists don’t believe their own words, even as they malign “deniers” who question their dogma. This week’s “Green New Deal” embarrassment merely offers the latest confirmation.